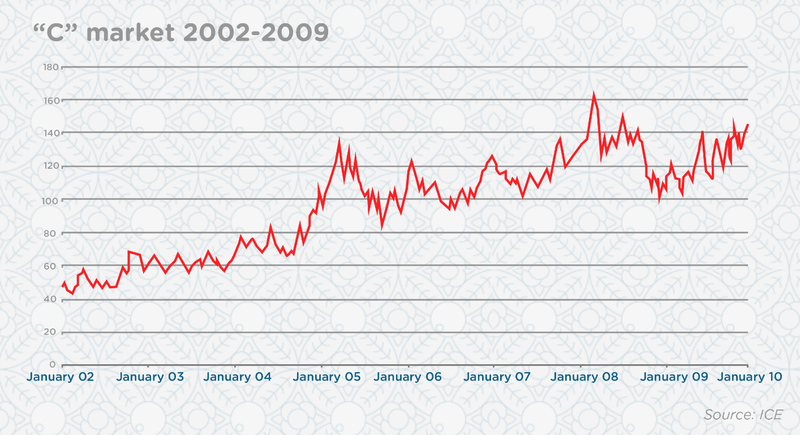 Coffee prices have been trading above USD $1 per pound for most of the last 15 years. 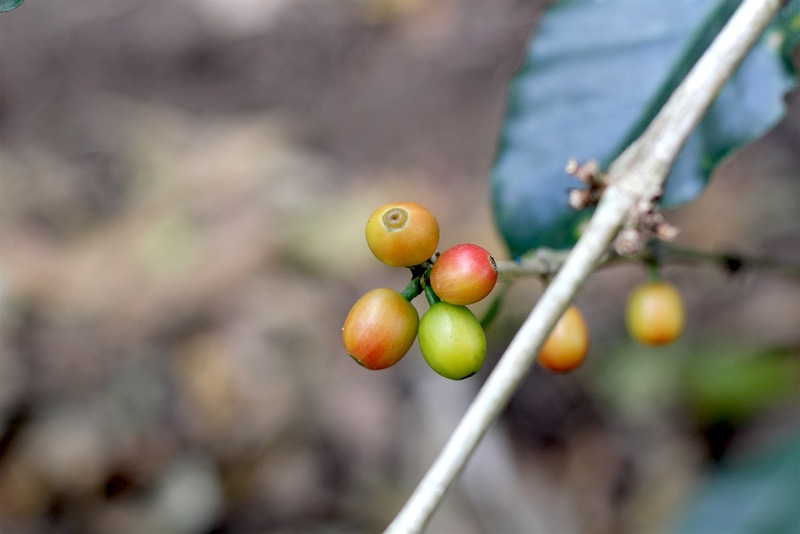 When compared to prices seen during the previous decade, coffee farmers have fared much better in the last few years than they did in the early 2000s: Between 2002 and 2003, prices failed to rise above 60 cents per pound; since 2005, prices have remained above $1 per pound; and in May of 2011, we reached the highest point in the last 18 years at $3 per pound. The average “C” price between 2002 and 2009 was $0.977 per pound, while the average price between 2010 and September 30, 2018, was $1.59 per pound. 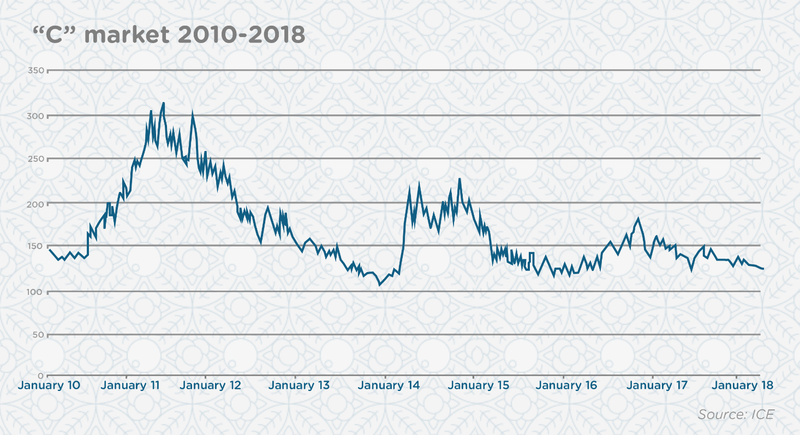 Additionally, between 2009 and 2015, the rust crisis drove physical differentials for most Latin American origins above 30 cents per pound, meaning the average price received by coffee growers during much of this time was even higher than the “C” price. To examine the profitability of coffee farming in Latin America more closely, I decided to simulate the income received by farmers during the last eight years, using the average “C” price per year and comparing it with an average cost of production of $1.20 per pound FOB. Since no reliable figures exist regarding costs of production, I used the numbers Caravela calculated in 2017 using our internal cost of production simulation model. This model estimates costs of production using market prices of inputs needed (labor, fertilizers, etc. ), plus assumptions about yields and labor productivity tailored to each country. The results of that model show us that in 2017, costs of production in the seven Latin American countries where we operate were between $1.20 per pound in Nicaragua and $1.80 per pound for Ecuador (see graph below). In 2015, a few coffee entities calculated the cost of production for smallholders was around $1.10 per pound. Given these numbers and taking into account inflation over this eight-year period, for simplicity’s sake I decided to use an average cost of production of $1.20 per pound FOB for the eight-year period. Using these basic assumptions, the graph below charts the profitability a farmer would have achieved every year since 2010. 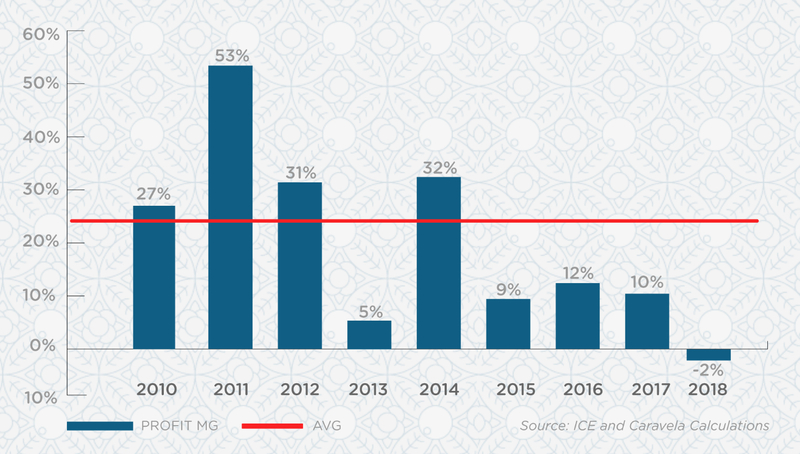 Profitability ranged between 53 percent in 2011 and -2 percent in 2018, whilst the average profit for the eight-year period was a very healthy 24 percent. Any business owner or shareholder receiving a 24 percent average net profit margin over the course of eight years would be very happy. So why is this profit margin insufficient for the vast majority of coffee growers in Latin America? It turns out that the majority of the world’s coffee farmers are smallholders owning less than 1 hectare of land, producing only an average about 5 bags (60 kg) per hectare every year — or less. 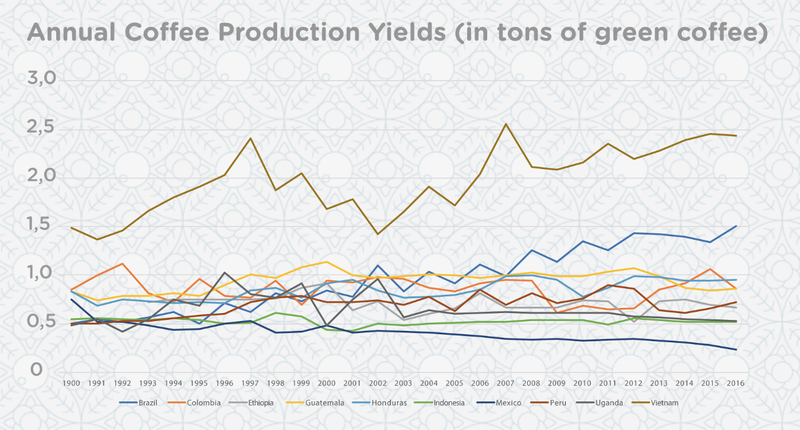 Unfortunately, coffee yields have remained flat or even decreased over the last two decades in most coffee-producing countries, except for Brazil and Vietnam (see graph below). As demonstrated in the table below, a small farmer with very low productivity (Farmer A), even with a 24 percent net profit, would have made a profit of only $21 dollars a month, or $247 dollars a year. As you can imagine, with so little money remaining in their pocket at year’s end, that farmer has scant left over to invest in his or her farm or improve his or her family’s quality of life. Small farmers are barely subsisting, so it’s no wonder that their children are opting to seek out more viable alternatives in urban areas. The situation improves when that farmer is able to produce at least 15 bags per hectare (Farmer B), but it still is not enough. 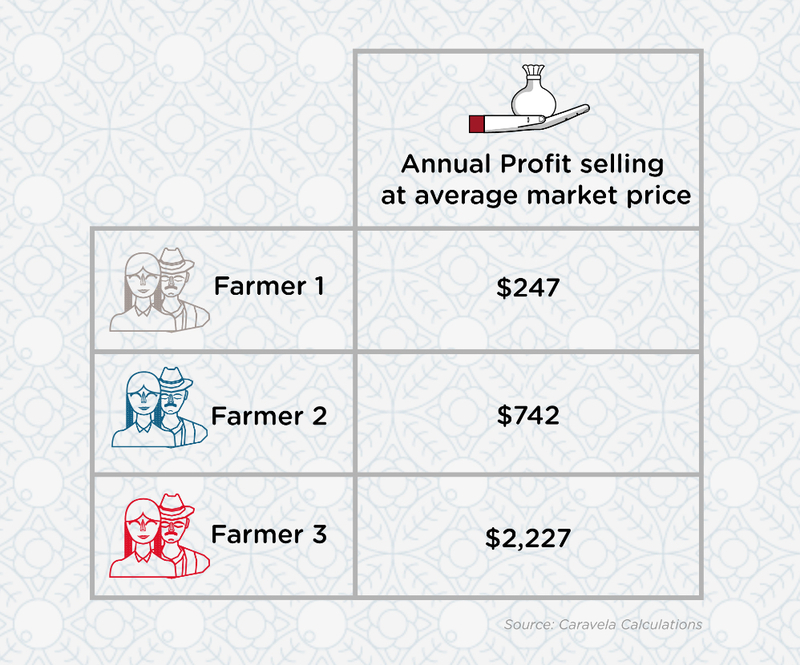 However, a coffee farmer with 3 hectares and decent productivity (Farmer C) would have made a $2,227 profit at the end of the year. 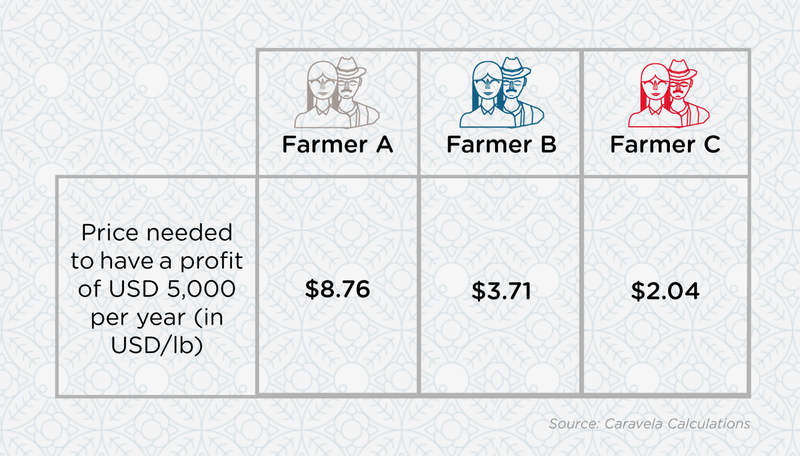 Although it’s still not a great profit, with this substantially larger sum of money, a farmer would be able to invest in his or her farm and/or his or her family. Now, let’s calculate the price we would have to pay a farmer if we wanted him or her to achieve an annual profit of let’s say $5,000 dollars. 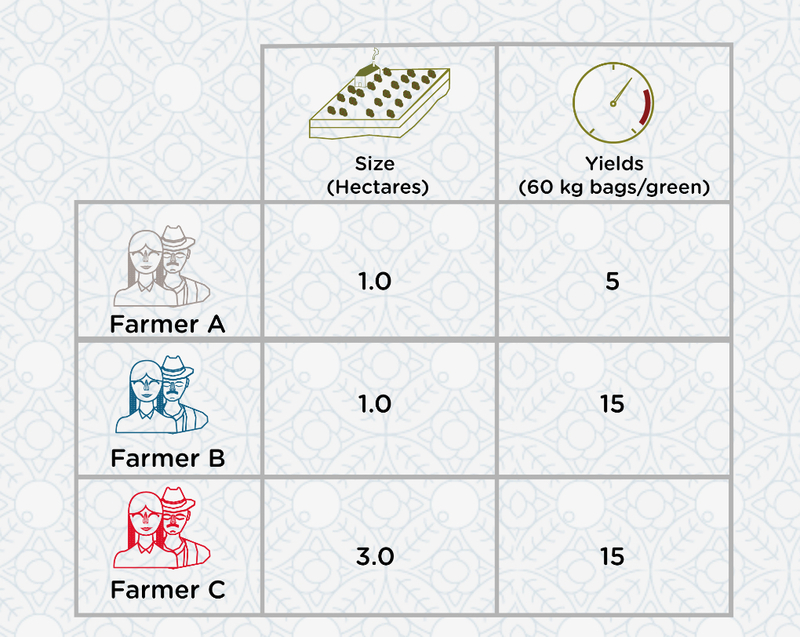 As you can see in the table below, the price needed for a small, low-productivity farmer would have to be extremely high, while the one in the middle group would also be quite high — prices that the vast majority of coffee roasters would not be willing to pay for coffees scoring below 86 points. Meanwhile, the price paid to the medium-sized, highly productive farmer (Farmer C) would be in a more reasonable price range. Clearly, the main issue facing coffee farmers around the world is not related exclusively to prices or profitability. There is a problem related to the scale of most coffee farms around the world, and to the lack of productivity suffered by most small farmers due to lack of capital and/or financing to purchase inputs, compounded by the lack of knowledge regarding optimal coffee farm management. 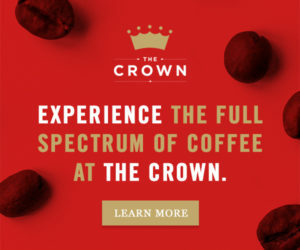 Buying all their quality coffee — not just the highest-scoring microlots — starting from 83 points, at differentiated premium prices according to quality, allowing producers to maximize their income, while incentivizing them to continue quality improvements. Developing long-term relationships with coffee roasters to reduce risk. Coffee trees take at least three years to start producing, and the investment is not recuperated until 5 or 6 years after planting; having good prices for one year is not sufficient. 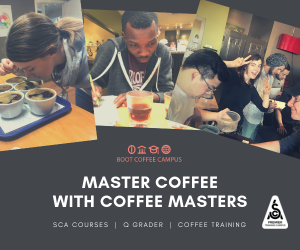 Providing cupping feedback, education and technical assistance through our PECA program to help coffee growers improve the quality and quantity of their harvests, reduce phytosanitary risks, and better manage their farms, thereby reducing costs of production. A roaster who wants to help secure the future of coffee must start by putting their money where their mouth is: Reward producers with good prices for all their quality coffee and commit to long-term relationships with those quality-minded producers to ensure they have income stability. Growers then know that roasters can be more than just clients; they can be true business partners. 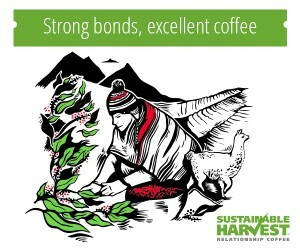 We have witnessed how coffee producers with long-term, fixed-priced contracts with roasters have been able to focus on producing quality coffee consistently, improving their quality of life and investing their profits to buy more land, thereby increasing their farm size, and their income, to sustainable levels. 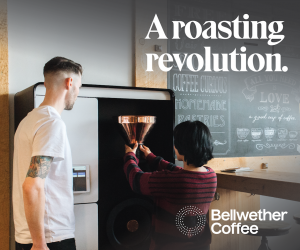 Alejandro is co-founder and CEO of Caravela Coffee, a quality focused green coffee exporter with operations in seven countries in Latin America and import companies in Australia, Europe and North America. After graduating as an Economist from the Universidad de Los Andes in Bogota, Colombia, he worked as an investment banker in New York and London before finding his true passion: making an impact in coffee communities in Latin America by helping build sustainable, long-term relationships between quality-minded small coffee farmers and roasters around the world. How can a small producer, like B, live with an annual revenue below 3100$? This is the Big issue.